The Rabbi with a Blog (Rabbi Jason Miller): Conservative Rabbi Asks Hillary Clinton "What's in Your Pocket?" Conservative Rabbi Asks Hillary Clinton "What's in Your Pocket?" 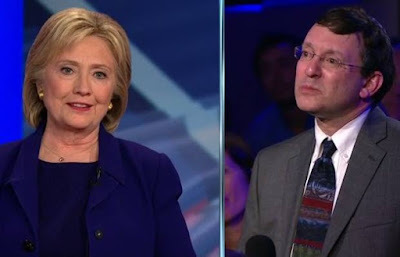 In last night's Democratic Town Hall in New Hampshire, hosted by CNN, Rabbi Jonathan Spira-Savett of the Conservative synagogue Temple Beth Abraham in Nashua made headlines with his question to Hillary Clinton. Another rabbi, Rabbi Simcha Bunem taught that every person has to have two pockets and in each pocket they have to carry a different note. And the note in one pocket says the universe was created for me. And in the other pocket the note says I am just dust and ashes. And I want you to take a moment and think about what you would tell us about your two pockets. How do you cultivate the ego, the ego that we all know you must have, a person must have to be the leader of the free world, and also the humility to recognize that we know that you can't be expected to be wise about all the things that the president has to be responsible for? I have friends who are rabbis who send me notes, give me readings that are going to be discussed in services. So I really appreciate all that incoming… And the final thing I would say, because again, it's not anything I've ever talked about this much publicly, everybody knows I -- I have lived a very public life for the last 25 or so years. And so I've had to be in public dealing with some very difficult issues and personal issues, political, public issues. And I read a, um, a treatment of the prodigal son parable by the Jesuit Henri Nouwen, who I think is a magnificent writer of spiritual and theological concerns. And I -- I read that parable and there was a line in it that became just a lifeline for me. And it basically is practice the discipline of gratitude. So regardless of how hard the days are, how difficult the decisions are, be grateful. Be grateful for being a human being, being part of the universe. Be grateful for your limitations. Know that you have to reach out to have more people be with you, to support you, to advise you, listen to your critics, answer the questions. But at the end, be grateful. Practice the discipline of gratitude..
And later in the town hall, Hillary added: "I am so fortunate that I still have my friends from grade school and every other phase of my life. And they keep me grounded, they keep me honest, they deflate my head, they deal with the universe in one pocket and the dust and ashes in the other. (laughter)"
Hillary actually just said this! "Thank you guys. I want to meet the Rabbi." Rabbi Spira-Savett's question and Hillary's well-worded and thoughtful response were covered all over the news. My favorite response came from Bill Clinton's former adviser Paul Begala, who tweeted, "Hillary Clinton has been my friend for 25 years. Her response to that rabbi is the Hillary I've seen in private: reflective, spiritual." SPEAKING OF WHAT'S IN YOUR POCKET? In 1918 when my father was five years old his family moved from Boston to Los Angeles. They changed trains in Chicago. Dad observed the following on a bench where three men sat. One was a large vulgarian. The man in the middle was an old Jew in Chassidic garb. The third man was a young Jew. The vulagarian (bulvahn) said to the old man, "Hey Jew, what time is it?" The old man made no reply. *&^% Jew, I asked you what time is it"
Well, the rabbi's premise, as he was taught, is fundamentally wrong. The Universe was not created, it has been there for a long-long time. There is no such entity who/what can create a Universe. I challenge him in the note that "I am dust and ashes". I will be dust and ashes on the day when I die. But on the rest of the days I am alive. So his question is irrelevant.